The past few weeks have been filled with lots of activity. Lots of work, and time for some fun as well. I hosted my first ever Christmas cookie swap. I had 19 friends and family members join us for the fun and we each baked three dozen cookies to share. I have never seen so many cookies on a table in my life. I had two of my nieces come and they were a tremendous help. 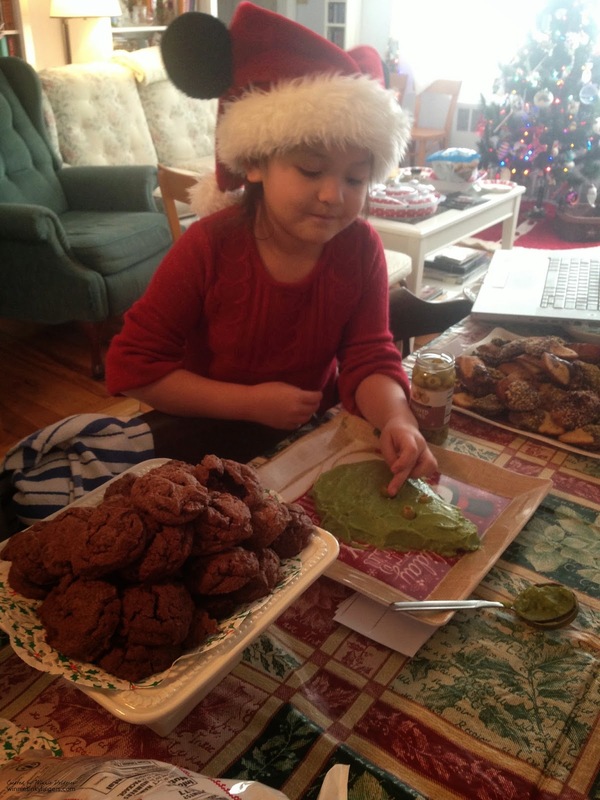 Little Grace (age 7) even made a Grinch guacamole for the party. Very sweet and tasty too! I think the party was a hit, and hope to make it an annual event. 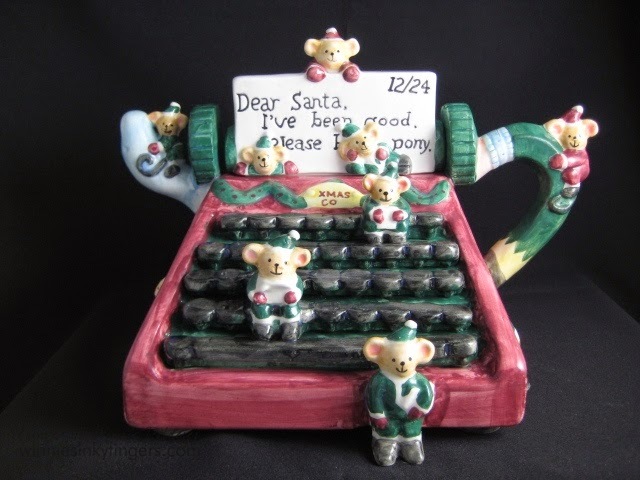 Since it is Christmas week, I decided to take out another of my Christmas teapots. This one was given to me over 25 years ago by my friend Sherri. Times have changed, as I used to type on a typewriter at my first few jobs, and this teapot always makes me smile to see it. I wonder if I could still type on one after years of typing on computers! Yours is the second cookie swap post I've read this morning and I find people are imaginative for boxing up their baked goods. Looked like fun, and the typewriter teapot is cute. What fun to have a cookie exchange! I haven't been to one of those in years. Your typewriter teapot is so cute and I know you treasure the memories. Cookie swaps are so much fun! How nice you had some little helpers! Love the Christmas teapot...how cute! Thanks for linking to Tuesday Cuppa Tea and Merry Christmas! A cookie exchange is always fun and they look wonderful all gathered together in one place like that. The children would think they were in a wonderland of sweets. The typewriter teapot is so unique and what a fun gift to receive from your friend. Thank you for joining me for tea, Winnie, and have a Merry Christmas with your family. Yep, I took one of those manual typewriters with me to college. So challenging to type a whole page without a single typo, wasn't it? The teapot is so cute. 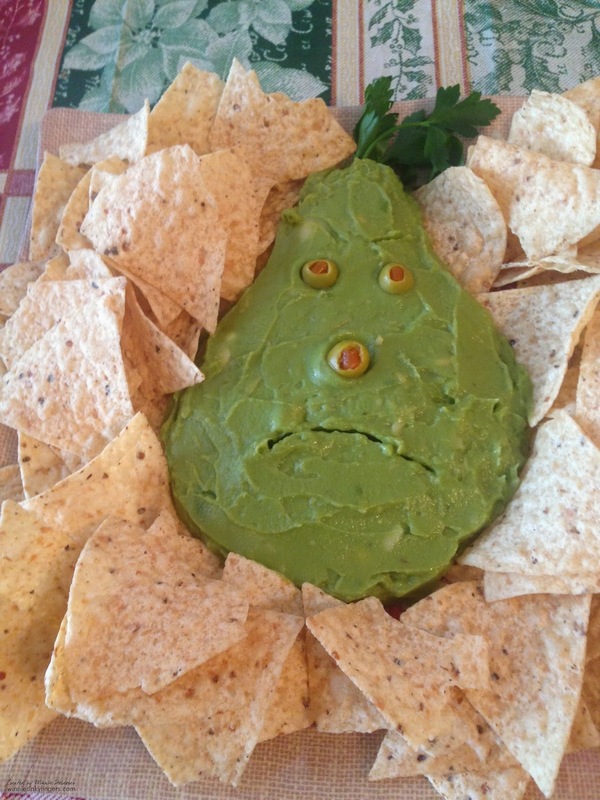 And so is that Grinch guacamole! Looks like your Christmas cookie exchange was quite a hit, sounds like a lot of fun! Merry Christmas to you! What a wonderful cookie sway! Wow, so many cookies! Yummy! Thank you so much for visiting my Christmas in the Parlor post and for letting me know you did so, I really appreciate that! 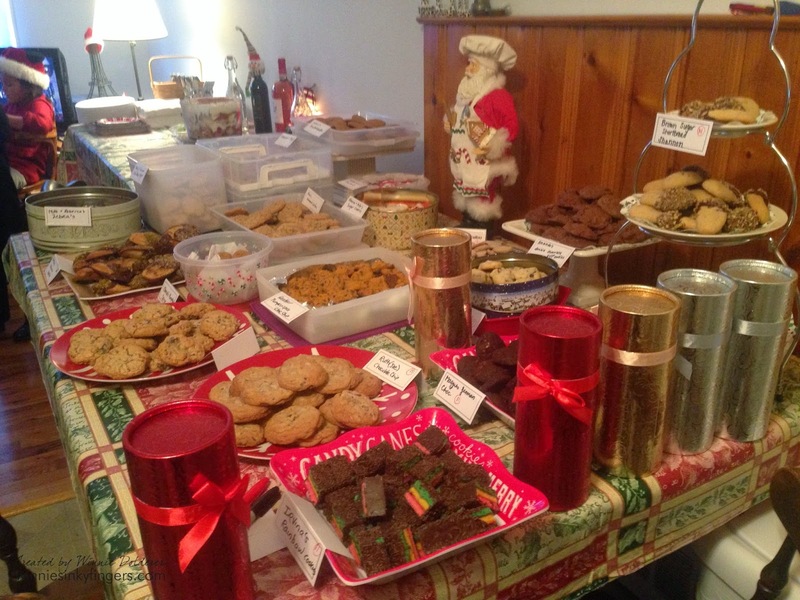 Love the photos of your cookie swap! I would have enjoyed participating! And that Grinch is the cutest thing!! Merry Christmas, Winnie! Wow! It looks like your cookie swap was a real success. However, it appears to me that Little Grace's guacamole Grinch took the show. Your teapot collection must be amazing, based on the few examples I've seen. Have a blessed Christmas and Happy New Year, my friend! Love a good cookie swap! I did 5 dozen for the one we recently did at church. But, that teapot typewriter is a winner! Would love to find something like that. As a writer, I collect writing icons. A prized possession is 1920's era typewriter. No tea with that unless it's in a cuppa on the side. A lovely holiday post. Take joy with your family this season! I enjoyed seeing your cookie swap. Merry Christmas to your and your family! The table looks so festive and pretty and that sounds like a fun party. Cute Grinch! Merry Christmas, Winnie! That teapot is adorable! I started out on a typewriter at work, too, and I always despised typing but I love computers. Go figure. What a lovely way to celebrate the holidays! Your table looks scrumptious and your niece's guacamole is just too cute. Wishing you and yours a very merry Christmas, Winnie! May the new year bring you much love, laughter and all the joys that life has to offer! That is truly a unique teapot - amazing really. Your your decorations are very fun! Wow - that's an impressive cookie swap! I love the teapot. So fun! Wow! Now that is a LOT of cookies. 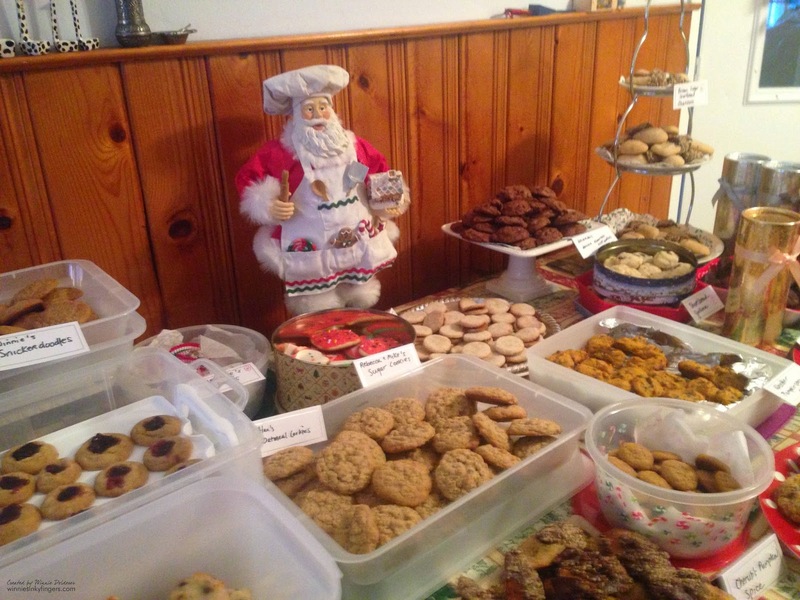 My daughter has hosted an annual cookie swap for the last few years and it seems to be growing in popularity. I know I liked having the variety for my holiday cookie plates. Looks like your was a super success! Wow, those cookies are making me hungry! What a fun event and you are so creative too! Winnie, Wishing you and your family a wonderful and Happy New Year 2015! May this year bring you lots of joy, love and many blessings! Oh my, what a fun post! Looks like your helpers were spot on! Love that Grinch guacamole - the cutest!! Happy New year, my friend - enjoy 2015! What a cute way to present that guacamole! All those cookies look so yummy. I bet everyone did enjoy that get together. Happy New Year! OMG Love your typewriter teapot! Thanks for sharing. Hope you had a wonderful Christmas.